How Many Dubia Roaches Does it Take to Start a Colony? Home > Guidance & Information > How Many Dubia Roaches Are Needed to Start a Colony? So you’re thinking about starting a Dubia roach colony and you want to know how many roaches you need. This is a common question, and there is an objective answer. However, your answer ultimately depends on things having more to do with you and your situation than Dubia roaches themselves. 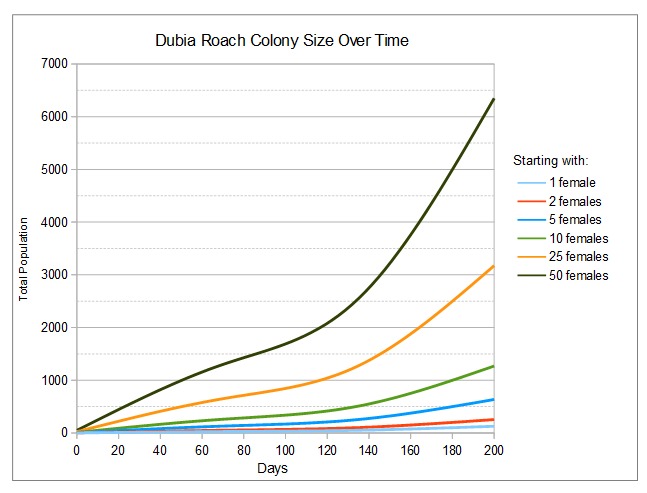 For your answer to be meaningful, you have to know the Dubia roach growth rate, but you also have to determine your goals for the colony. Identifying your goals involves answering a few basic questions about your intended colony size and function. For example, do you want the colony to supply a steady stream of feeders? If so, how many and how often? Do you just want a big colony without concern for feeders? If so, how big do you want it to be? And importantly, when do you want it to be that big? Is next year OK or do you want it sooner? The reason the answer to the “how many roaches do I need…” question depends on you and what you want for the colony is because there is no set number of Dubia roaches required to start a colony. In theory, you only need one pregnant female. Or you can start with a single male and and a single female…or several of each…or a dozen, etc. Obviously then, how fast this potential colony grows and how soon it reaches the size you want is the real question. If you want a colony of 10 roaches, starting with just a few is probably fine. However, you will need to start with many more if you want a colony of 10,000 in a reasonable amount of time. But how many more, and in what time? These are the questions at hand. The first step toward finding an answer is determining your needs and expectations. From there it’s easy to figure out the number of Dubia roaches you need to start a colony that will do what you want, when you want. So decide on a goal. From there we can use Dubia roach reproductive physiology to calculate a starting point. It’s a sort of “reverse engineering” approach to building a colony, if you will. The estimate is rough, but the numbers work. The rest is in the implementation. All things equal, newborn Dubia roaches reach adulthood in about 5 months. Newly emerged males begin mating almost immediately while newly-emerged females start about a week later. Females can become pregnant as soon as they begin mating, and their gestational cycle is 65 days. This means the earliest a female can give birth to a batch of nymphs is 72 days after the day she reaches adulthood. This is roughly 220 days after she is born. We estimate that females give birth to about 25 nymphs in the conditions common to home Dubia roach colonies. The actual number may be more or less, but 25 is a reasonable average. They repeat this every 65 days. So let’s say, for example, that you start a new colony on day 0 with 5 newly-emerged females and one male. You can expect 125 newborn nymphs in 2.5 months, then again every 65 days after that. Assuming a 75% survival rate and a 50/50 male:female ratio, the first nymphs born will begin giving birth at about 7.5 months. At this time you will have about 50 adult females and 1,250 nymphs. At 7.5 months, the population begins some pretty serious exponential growth as the first batches of nymphs begin having babies of their own. This is a good cut-off point. At this time you will have a colony with many thousands of roaches whether you started with 10 adult females, 50, or even 100. If you can wait a year, this discussion is largely irrelevant. At that time almost any starting number will yield many thousands of roaches of all ages. But this takes a year. You may decide that’s too long to wait to reach your population goal for the colony. What can you do if you don’t want to wait? How many females should you start with to have 1,000 nymphs in four months? How about three months? What if you don’t want to wait a full 7.5 months for the roaches to complete one reproductive life cycle and for the colony to become self-sustaining? You’re in luck! We put together the following graph using the formulas and averages mentioned above. The data is based on the most accurate estimations of the Dubia roach life and reproductive cycles we could find. You can use it to estimate population start and endpoints. This means you can decide what you want your Dubia roach colony to be, use the information above to determine how many roaches it takes to be it, then plot how many you need to start with to get there. The data essentially allows you to plot nymph population as a function of starting female population and time. You can figure out roughly how many nymphs you’ll have in a new colony at any given point in time between 0 and 200 days, given an initial starting female population of between one and maybe 60 or 70. Again – rough estimates. You can extrapolate population based on higher starting numbers or more time, but as you can see, the population goes exponential. We actually removed some data (starting populations of 75 and 100) because the scale necessary to display such high numbers made the lower results impossible to read. It’s fair to extrapolate though, if that fits your situation. NOTE: “Total population” is nymphs plus adult females, so just subtract the number of females from the total to get rough nymph numbers. If you know how many nymphs you want the colony to have at any given time, you can estimate the number of females you’ll need to start with to get there. So that’s basically it. Colony size as a function of starting female population and time. Or, work backwards to hit a population target. Simple. This should answer the question of how many roaches you need to start a Dubia colony. Keep in mind though that while these projections are based on real averages and actual Dubia roach physiology, your mileage may vary. Factors influencing Dubia reproduction and colony population growth are many. They include temperature, food availability, crowding, stress, etc. We’ve written about these things in our Dubia Roach Breeding Guide, which we recommend reading if you’re interested. Learning about Dubia roach breeding is the logical next step in planning and implementing your new colony. We’ve also written several other in-depth articles on related topics that you may find interesting, including one on maximizing the natural B. dubia growth rate and another on diagnosing and curing Dubia roach breeding troubles. We hope you find this information helpful. If you have any questions, please feel free to ask below! I am trying to breed my Dubia’s. currently I have 6 adult females and 6 adult males in the same large container. They have been in there for at least 3 months now and I was wondering if I have to many of males in there, Should I continue with that ratio of roaches in the same container? The container is a 25 gallon black container with plenty of ventilation and a heating pad under the container. The colony sits in my closet where it is dark and very warm. Plenty of food and water crystals. Am I doing this correct or can you give me some advice? David – take a look at our Dubia roach breeding guide and articles on population density, breeding, etc. 90 days is enough time for the colony to start producing offspring assuming conditions are adequate. If problems exist they are more likely to be something like temperature than too many males, though I can’t rule that out. I suggest reading our Dubia Roach Breeding Troubleshooter for more on what specific problems may exist in your colony that could prevent timely breeding. So with only six females in the colony you don’t need six males. One would be enough if you knew it was healthy and fertile. Six males could cause stress but I don’t know if it would be enough to explain the lack of breeding. If it were me I would probably cut the male number in half but keep them around in case something happens to the breeding stock that remain. Females do get larger and their bodies elongate when carrying eggs, so maybe there is no problem at all. I haven’t been using the cut out holes with screen for ventilation. Instead, I used my drill with an extremely small bit size and drilled lots of holes on top and around the upper sides. Is this adequate ventilation? The goal is to provide enough airflow while avoiding new problems in the process, so as long as you’ve done that you’re fine. The method is less important than the result. We are new leopard gecko owners, and currently have 10 adults and sub adults. They vary in size from 45g all the way up to 73g. I have changed them over to srtictly dubias with only a cricket or mealworm when my local pet store is out of roaches. We are wanting to start a new breeding colony to feed all of our geckos plus one juvenile Savannah Monitor. The geckos are on a every other day feeding schedule, some taking only one medium to large roach to the biggest one taking 5 large on occasion. Ive got all the supplies to start my colony and have researched for hours on how many to start with. I found your guides to be one of the most informative, and thought maybe you could give me a good guestimate on what to start with. I was thinking 25 adult females, 7 adult males, and maybe 100 mixed size roaches if it doesnt get too expensive, keeping in mind I still will have to supply seperate feeder roaches to my reptiles until it gets established. Any advice on a good number to start? I would appreciate it so much. Thanks!*! Glad to hear you found our information helpful! So your question, if I understand it correctly, brings up issues relating to Dubia cost vs. productivity assuming a starter colony that includes not just adults, but also nymphs of various stages. I think that could all be worked out, but the answer is still going to depend on both time and cost. In other words, there will always be sacrifice of one or the other, and where you ultimately decide to settle takes both into account. I don’t think there will be a single point identified as “the fastest and the cheapest”. And, key variables such as growth rate, adult productivity, etc. will vary from set-up to set-up. Temperature, humidity, light & dark, nutrition, and more probably have a big enough impact that the results are only relevant to the environment tested. They may become meaningless as you move from one environment to another – from one set-up to another – given the variability that I know is out there. Having said that, my sense is that rather than females, males, and mixed sizes, I might recommend getting as many females as you can, then adding males in a F:M ratio of anywhere from 5:1 to 7:1. This assumes that the 100 mixed size Dubia you mention are intended as breeders once they mature rather than feeders, and that you would feed your animals with separate roaches from the pet store you mention. Both strategies will work (adults+nymphs, adults-only), but I think focusing more on breeding females will probably get you where you want to be the fastest…unless you got really lucky and picked the right mix of nymphs at the right price that would result in the largest colony in X time. But I think the odds of hitting the “best” mix for you, if it even exists, is very low. So your idea brings up another issue, which is that in our experience, mixed Dubia colonies tend to do better than those containing roaches separated by stage – in this case colonies of adults vs. adults & nymphs. However, this benefit is not enough to make buying 25 females and 100 nymphs worthwhile. Dubia will breed just fine in adult-only colonies, so I would recommend shifting your budget to something like 90% females and males and 10% nymphs. This seems more in line from a (potential) benefit/cost perspective. Of course, regarding this particular issue, you could go with all adult females & males and be just fine. The 10% nymph idea is a nod to your idea as well as the notion that there may be a benefit…and it keeps that benefit in perspective. In other words, in our experience it does exist, but it’s probably pretty small. And…it keeps in perspective the risk/reward of shooting for that “right mix” of nymphs that will result in the most Dubia over time. You could even try 80% f/m and 20% nymphs. This seems like a reasonable range given what I know about the potential benefits you might see from it. I have an 18 gallon tote that currently consists of 60 females and 10 males, plus an unknown number of nymphs. Probably 50 or so. I would like to add some more adults to the colony, but how many is too many in a tote that size? The key is usable surface area of whatever harborage you use. A (very) general rule for egg-crates, for example, is 50-100 adult Dubia roaches (or comparably sized nymphs) per egg-crate. This includes front and back. So for example, if you have six egg crates in your 18-gallon tote, that translates to a maximum of 600 adult Dubia or 600 (adults + comparably-sized nymphs). With this density, you’ll have to remove newborn nymphs as they arrive. If you don’t, it will become too crowded. With fewer roaches – say 50 to 75 adults per egg-crate – you can separate nymphs from adults less frequently. My roches haven’t made any more they have been together for 4 months and the ratio is 10 females and 2 males what am I supposed to do. One (or several) of many things could be causing your breeding issues. Without knowing anything about your situation, I suggest (a) checking out our article about Dubia roach breeding. It’s a comprehensive breeding guide, and I think you will find it helpful. After that, (b) read our post about Dubia roach breeding problems. This is an in-depth guide designed to help you diagnose and fix whatever problems may be going on with your Dubia colony. Hello, you’re site has been very helpful to me – but I wanted to ask what to do if the developing babies reach adulthood and you end up with far too many adult males? You could feed them off to your animals. Hi, this is the most informative post I have read on insect breeding in general. I started with 500 Dubias close to adult size in August last year, with the 1st nymphs arriving beginning Dec. I have since split the colony into 2 tubs (80lt approx 21 gal ea). A mix & match of aduIts & nymphs into each tub. I am planning to leave them until Dec but will obviously split them into more tubs as new nymphs arrive. July/Aug should see the Dec born nymphs producing their own offspring. At the end of this year I will start using them as feeders for my reptiles. By then there should be quite a large colony. I started to breed Mealworms, Superworms, Crickets & Turkistan roaches as well in the latter part of 2018, with the Turkistans being the last to arrive. My aim is to open a reptile rescue center here on the East Rand. (Eastern part of Johannesburg, South Africa). I currently have 36 reptiles which also begun from zero 6 months ago, but this number will probably reach around 100 by year end. Thank you once again for sharing your knowledge & expertise with the people whom are eager to do things correctly with regards to breeding insects, especially Dubia roaches. I’m considering starting a cockroach colony myself I found this very informative. I plan on reading you’re breeding tips and guides here very soon thank you ?